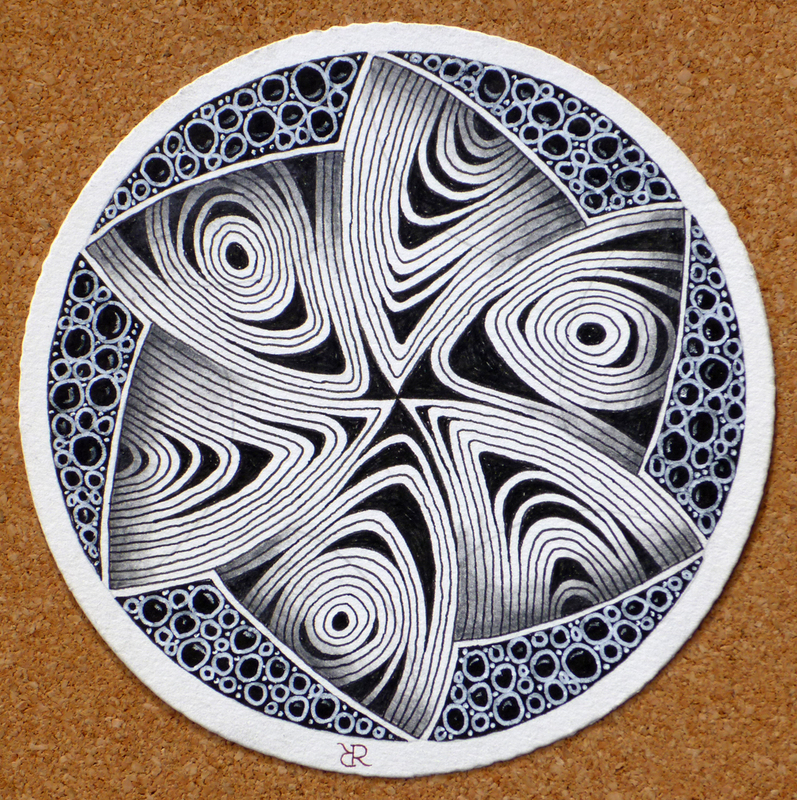 I am the diva - Certified Zentangle Teacher (CZT®): Weekly Challenge #100!!!!!!!! Fair Warning: this is a long and image heavy post!! B-rad, I love you. 9 years ago today you asked me to be your wife, as we sat in your car and made out at the top of that hill in Calgary. I said yes, and i'm so happy i did. MWAH! I've added a new widget to the right sidebar of my blog - It's a music player for a totally awesome band called "Georgia Sound" and you should most definitely check it out (but not right now... i'll explain in a minute). OHMIGOSH OHMIGOSH OHMIGOSH!!!!! Welcome here, all my peeps!! Welcome to the ONE HUNDREDTH WEEKLY CHALLENGE!! i was just re-reading my first challenge this morning - which was posted on December 20th, 2010 (that makes us 2 years old this week!!) 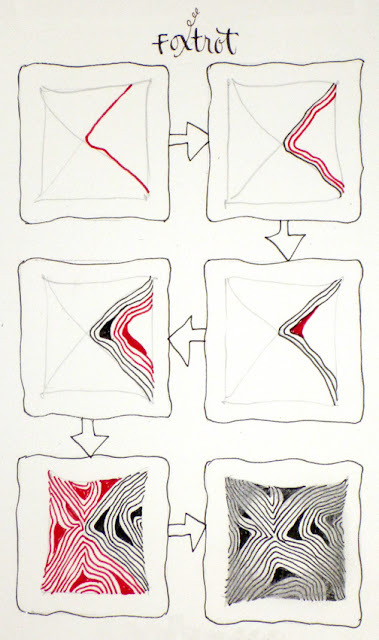 and thinking about how far we've come together as a fabulous Zentangle community. I have to say that i am so humbled by the success of this hair-brained idea, and i want to thank each and every one of you who has joined us in this amazing journey, who has participated each week, who has commented, who has helped to create this community of artists, who has come on this crazy medical journey with our son Artoo, the emails, the cards, the virtual and real life hugs - i am blessed. Truly. Today i'm so excited to give you this week's Challenge. 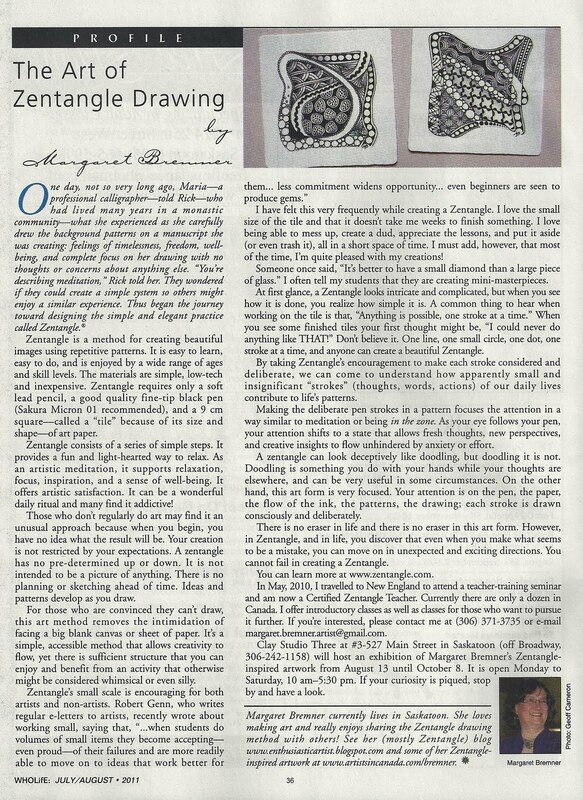 It's a guest post given by none other than Maria Thomas and Rick Roberts, founders of this amazing ride called Zentangle! SQUEEEE! Weekly Challenge #100! 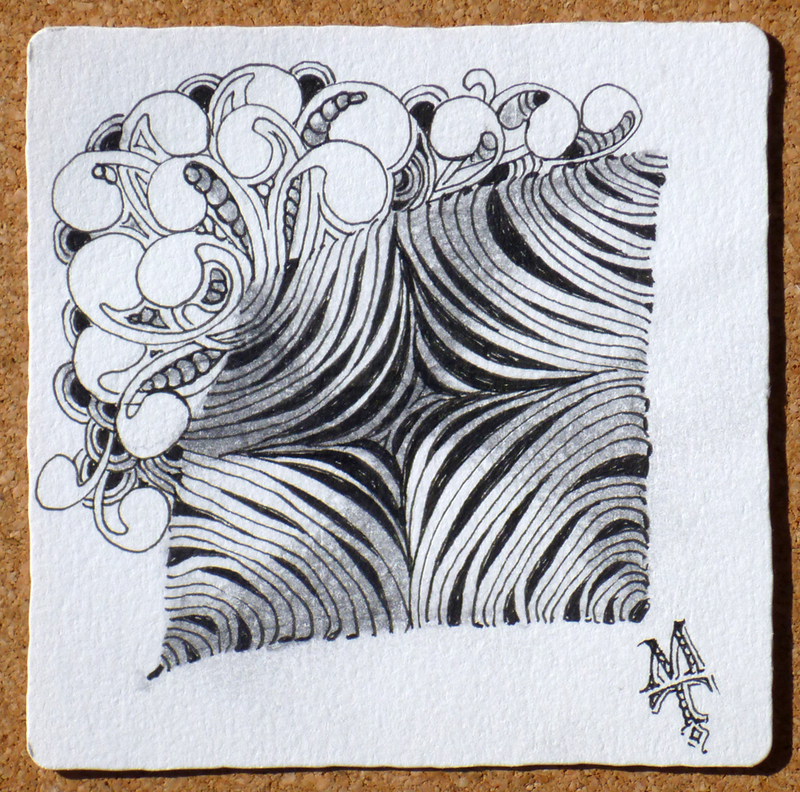 "New tangles and a Diva Dance"
Rick and I first met Laura Harms in May 2010, at Zentangle CZT Seminar III. She came all the way from Saskatoon, Saskatchewan. The Diva, as we now know her, was quiet but had that je ne sais quoi . . . I think she just sparkles. She tells her story, makes everyone feel good about themselves, and judges no one. 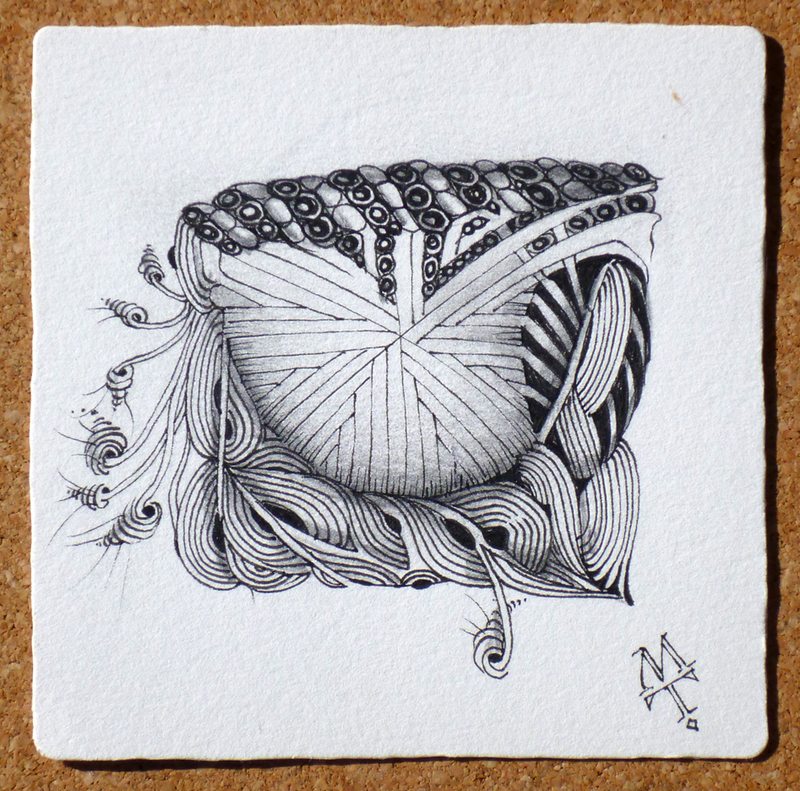 She has created an arena for people to share, encourage and admire Zentangle art from around the world. She not only challenged us to do things we might never have thought of, but then asked us to get up the courage to exhibit them on her site for all to see. All this without the worry of winning or losing. And in true Zentangle fashion, there was no criticism, only wonderful comments on one another's art. Heartfelt thanks to Our Diva, Laura Harms, for creating simple excitement, friendships, . . . and artists. I want to take this opportunity to give a very special extra big THANK YOU and hugs to Maria Thomas and Rick Roberts who are just amazing people, and i am so lucky to have them in my life. Thank you for the inspiration, the encouragement, the friendly emails and phone calls. You two have given me an amazing gift, and i'm so happy that i get to share it with everyone each week! mobile from iamthediva on Vimeo. It took me several tries (four to be exact) to get the camera angle right, the lighting proper, and the proper file format - before we arrived at the finished product! B-rad was my ever helpful camera man and helped me hunt for over an hour for the camera cable for our camcorder (which we ended up not using anyway, incompatible file format with iMovie!!! GRR!!!). This project took a better part of our Saturday afternoon and evening, and then spilled into Sunday as well. My husband has the patience of Job. I have the patience of a four year old. If you enjoyed the soundtrack you should go visit my friend Ryan Roy at Georgia Sound's Facebook page, and tell him i sent you. You can also purchase their album on iTunes here! Also, the last bit: After the whole process of creating this video - i'm ready to give my tiles a new home. So, next Monday - i will randomly select 4 people from the comments and i will send you one of these video tiles. If you want one, just say so in the comments and you're entered. One of these bad boys COULD BE YOURS!! Rock and Roll: anything goes, let 'er rip! This is a special day for you, but also for all of us, tanglers. I say it every week on my blog, but I will say it here again, and from the bottom of my heart: THANK YOU SO MUCH!!!! Enjoy the Holidays with your loved ones, you deserve it! By the way, the tiles you creatied are beautiful and I would love to have one. Congrats and Happy Anniversary on the 100th challenge as we all love them GREATLY... I have learned so very much from being pushed into areas that I would not generally go... Thanks for it all... also Congrats on this special day ... B-rad and you are very lucky to have each other and to be able to enjoy your life together. It is very important in all ways. Happy Life. Happy anniversary, LAura! And happy, healthy holidays and New Year to you and yours. So for the New Year I am going to set up so I can more fully participate by (finally) stepping out and sharing my work. I will be inheriting my son's digital camera ( ah, Christmas is coming - and HE is getting newer and fancier), so I will work on the how-Tos of Flickr and/or a website. Happy Anniversary for 100 Challenges. Thank you for these 100 weeks of creativity and friendship. I wish you and your loved ones a Very Merry Christmas, and a fantastic New Year!!! Congrats ! it s a double celebration . Happy Anniversary !.I wish you Marry Christmas and a huge Thank you for inspiring me (and many others),thanks for your wonderful ideas and art.Beautiful new tangles,looking forward to the challenge. Congratulations to You! And Happy Anniversary. I too want to thank you for your dedication and inspiration. Cheers for you and best wishes for a Merry, Merry Christmas for you and yours. Congrats on reaching 100! and the guest challenge from Rick and Maria...what an honor! I am so happy to have this wonderful fun new challenge! Thank you so much Laura! Merry Christmas and Happy New Year from my house to yours! I was in such a hurry this morning that I didn't wish you a Happy Anniversary! I do want you to know that your family is incredible and you inspire me each and every Monday as you blog and share your love of life and family! Thanks again! Laura, I keep coming back to look at your tiles and each time they just grab my attention with their beauty and I must say, they are spectacular! First of all, HAPPY ANIVERSARY! 100 times you made this challenge for us. Me mysel and I only jumped in at #83. And it feels like a lifetime. Every monday when I come home from my work I go to your blog to seeyou@ the next challenge. Because of you I started a blog, I found out that I can draw beautiful things, and I love to meet all the other zentangle artists on the web. I do want to thank you for all those beautiful things and experiences. I wish you a very nice and great holiday with your beloved ones, and i'm looking forward to the 7th of january. And yes I would love to get one of those ZT, It would be a great honor to have a real Diva ZT. Again thank you so much and have a healthy 2013 for you and your family. 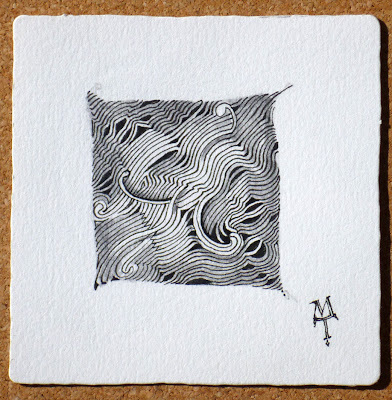 creative challenges - I would love to have a ZT tile of yours. They are all lovely. Love the new tangle from Rick and Maria and you and Brad did a great job with the video. Have a very Merry Christmas and a healthy and Happy New Year. Enjoy your family vacation time and see you next year. I'm new to Zentangles and luckily ran across your blog. How cool! Looking forward to exploring more. Thank you! 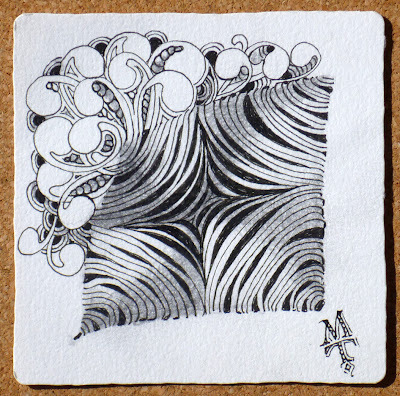 I am new to the Zentangle world and was directed to your blog by Maria's email. It took me awhile to figure out why my eyes were sore; I had been staring at your tiles and not blinking. You truly ARE The Diva! I would be humbled if any of your tiles should find their way to my home. They would be displayed in a place of honor and used as inspiration for my own tiles. Congratulations. 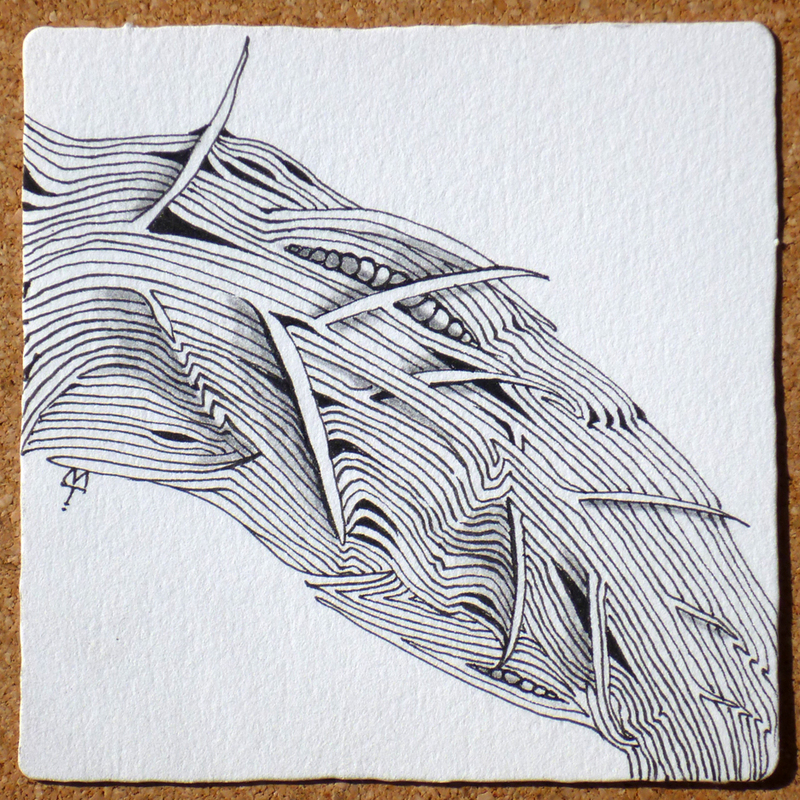 Love the blog and tangles. New to tangling but hooked already. Happy Anniversary! Your work is so inspiring and I love reading your lovely blog entries! Wow! Laura thank you very much for your inspiration. I'm a baby at zentangle but I am addicted! It's such a pleasure to watch and learn and try new tangles! New ideas abound! I would appreciate one of your tiles. Have a wonderful holiday and a wonderful vacation! Thank you! Thank you for everything! 100 Weeks WOW, congratulations!! Hope you have a very Merry Christmas and a Happy New Year!!! I will be looking forward to seeing what you have in store for next yeat. All your tangles are lovely, and I would enjoy having one. Happy Anniversary Laura. 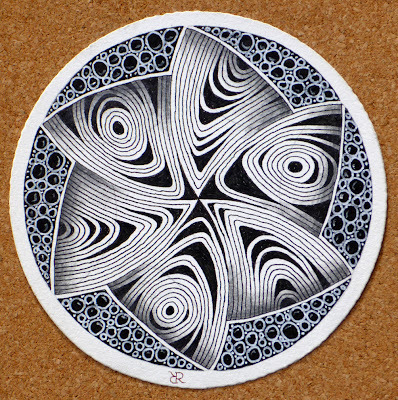 I have shared a wonderful Zentangle world with you, your family and all the Zentangle artists and I thank you. 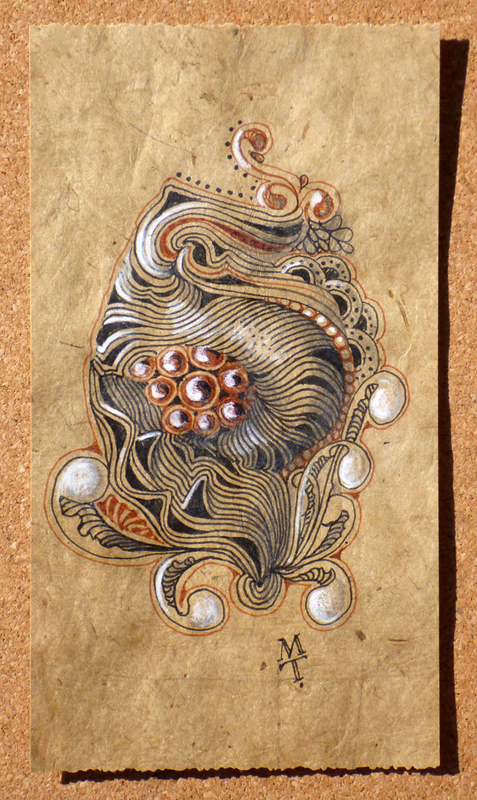 I look forward to your weekly challenge and all the creative Zentangles from everyone in your Diva Community. What a great honor to have Maria do the 100th Challenge, I am so happy to be a part of your weekly challenge. I enjoyed the soundtrack and did go to Itunes and purchased it, your video was awesome, thanks to Brad too. You can put my name in for your video, would love to have it. Wishing you and your family a blessed Christmas and joy and good health in the New Year. Thanks for all the creativity this year. Happy Anniversary with the 100th challenge you offered us. What a milestone. Thank you so much for your dedication to do this every week for us. Thank you that you inspire us so much and let us play and dance with the wonderful tangles and share and admire them with other tanglers. Enjoy your holiday break and have a fantastic familytime. Merry Christmas and a healthy and creative New Year for you and your family. Aww, so many things to celebrate! Cheers to everything and all the smiles you have created and shared in your life. Also it would be an honor to win one of your awesome tiles. Love your work. Happy 100th, Laura!!! Fabulous challenge! Love the video--thanks for persevering!!! I couldn't wait to start and finish my tile--Diva Dance is so inviting and fun. I am suer I'll be submitting another later this week. Cheers! Hugs! THANK YOU, Laura, for being you and doing what you do!!!!! Laura, what a happy and joyful post, and how great to have a tangle in your honour! It's a good one, too! I would LOVE to be lucky enough to receive one of your tiles, so please count me in on the draw! Have a great and well earned rest over Christmas, and love to all the diva gang. Oh dear--forgot to say that I would love to give a Tennessee home to one of your tiles, if my name comes up on the dance card! Congratulations, Laura, on the special anniversary, and special challenge of your 100th! Becoming part of the challenges in the past couple of months has really helped me feel part of the community, and everyone is so encouraging when they comment. 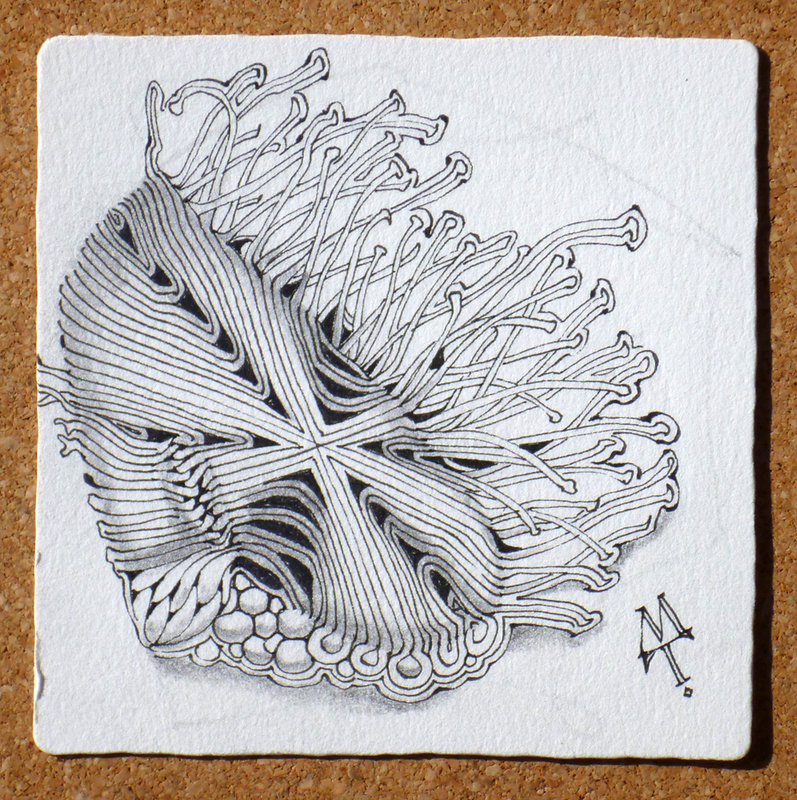 You have enriched my zentangle experience immeasurably.I am very grateful. I wish you and yours health and happiness, in the new year, and the very best of the holiday season. 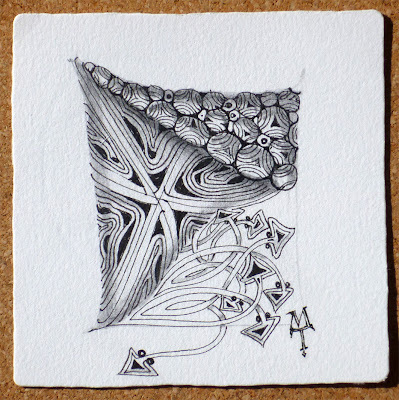 I would love to be part of the draw for the tile, because you have become such a special part of my Zentangle journey. I would welcome a touch of your beautiful work and generosity of spirit in my home. 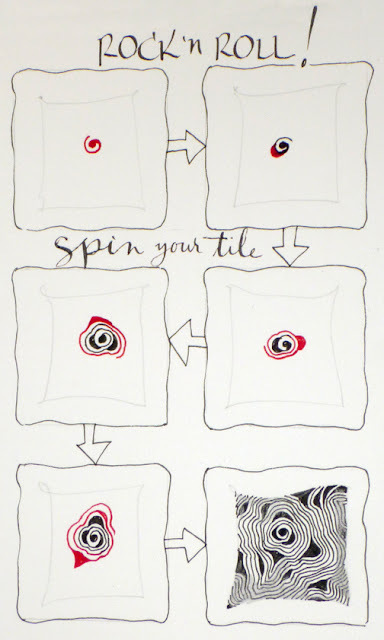 interesting blog- my first visit- enter me in the tile draw please. Laura - what a wonderful post - I am getting ready to begin to take up your challenges - I'm rather OCD and have had to go through a process of finding and organizing tangles (what a journey) but having got that under control (though I did learn a lot on the trip!) I can make time to undertake the challenges! You deserve all the praise heaped on you for many many reasons! I hope you and your family have a wonderful, healthy, holiday! See you in January! I would love to have one of your video tiles - it would be a special gift and a joy! Laura, I think that you and B-rad are very special parents to Chewie and Artoo. Congratulations on 100 challenges! And to having a special tangle made for you by Maria. Have a wonderful holiday. Thank you so much for this! I have dabbled a little in Zentangles (self-taught) and am so glad to have found such a wonderful resource for pushing myself in new directions. I would love one of your tiles! Congratulations on your 100th! I haven't been around long, but your dares are a fixed date now. "Bird spotting" has a narrative feeling about it, but I was really only trying out the patterns and it all got a bit complicated. I'll post other attempts later. Congratulations on hitting 100 weeks! What an achievement - yes I would love a video tile! I'm a newbie - gonna start in 2013! Happy anniversary (9 years! 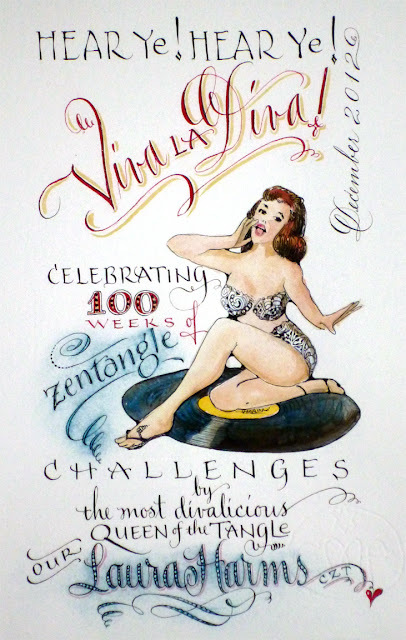 ), happy anniversary (2 years on the Diva blog) and congratulations on 100 challenges. Its certainly a week for celebrations!! I love your blog and your challenges, though I haven't tangled for a while, due to a zillion other commitments, but it is now school holidays here in Sydney, Australia, and I have 2 months off from teaching and plan to just enjoy myself, rediscover tangling and visit this blog for the challenges and strings I have missed. Thanks for a great, inspiring place to visit. Enjoy your very well deserved family break and we'll see you in the new year. Wow!! Happy Anniversary to you and B-rad!! And congratulations on your Centennial Diva Challenge! So cool of Rick and Maria to co-post! I love the new tangles and I would completely love to have one of the video tiles! Yay!! Thanks for all you do every week with the challenges, Laura, looking forward to a hundred more! Wishing you an awesome holiday season! Three cheers hip hip horray to you Laura, B-rad and your boys!!! You have done so wonderfully well to keep going and soldiering on with 100 weeks of tangling challengers. Wow, what an extra special way to celebrate, a Diva Dance with Rick and Maria. 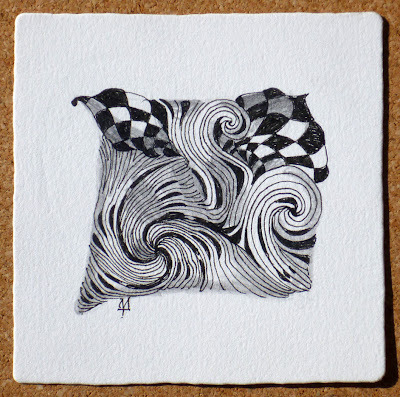 Hugs and thanks for the chance to win one of your tiles. Happy Christmas, keep safe and warm! Wow! 100th challenge and my first entry together. I already sent you my entry via e-mail as I do not have a blog. In true Zentangle fashion, one stroke at a time :). I love your site. Keep up the super job! Oh, and yes, I would love to have one of your tiles too. Congratulations, Laura, and yes, I would love to win one of your tiles! Congrats on 100 challenges. How awesome is that? 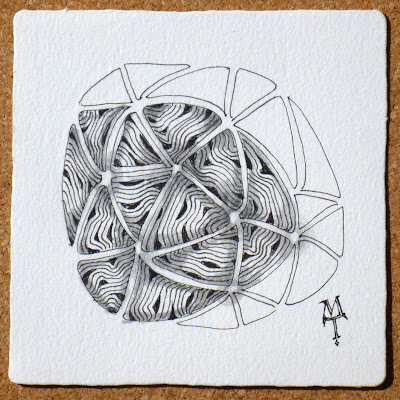 I love these dance tangles from Maria & Rick. I'm going to go play with them and get my challenge tiles ready to post. And YES! 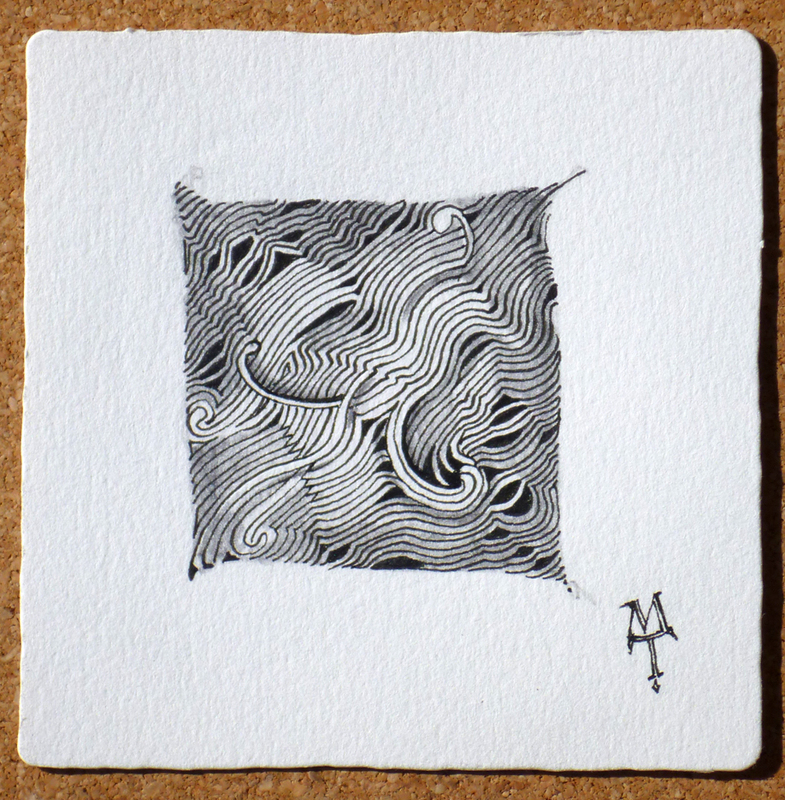 I would love to win one of your own tiles. Thanks so much for offering. Congratulations on your Blogiversary....that is quite an accomplishment. Love your tiles and would adore winning one....Merry Christmas to you and yours. Just found your blog through Maria and Rick's newsletter. I can tell I will enjoy it here! Thanks for the challenges. I sent a link to my definitely "lift" from your wonderful tutorial. You made Diva Dance look so fun, I just had to try. My first entry. Maybe I'll aim for every 100 challenges. I enjoy them but the process of scanning and e-mailing isn't fun. Happy anniversaries! Congratulations and have a wonderful Christmas break. Congratulations on your dual hallmark events, 9th anniversary and the 100th Challenge. I have not been involved with them for very long. I think my first was somewhere around the 87th so am a newbie, but hope to participate in many more. They help me try new things and continue to work on this fun, relaxing and delightful art form of Zentangle. Thanks again and looking forward to many more. 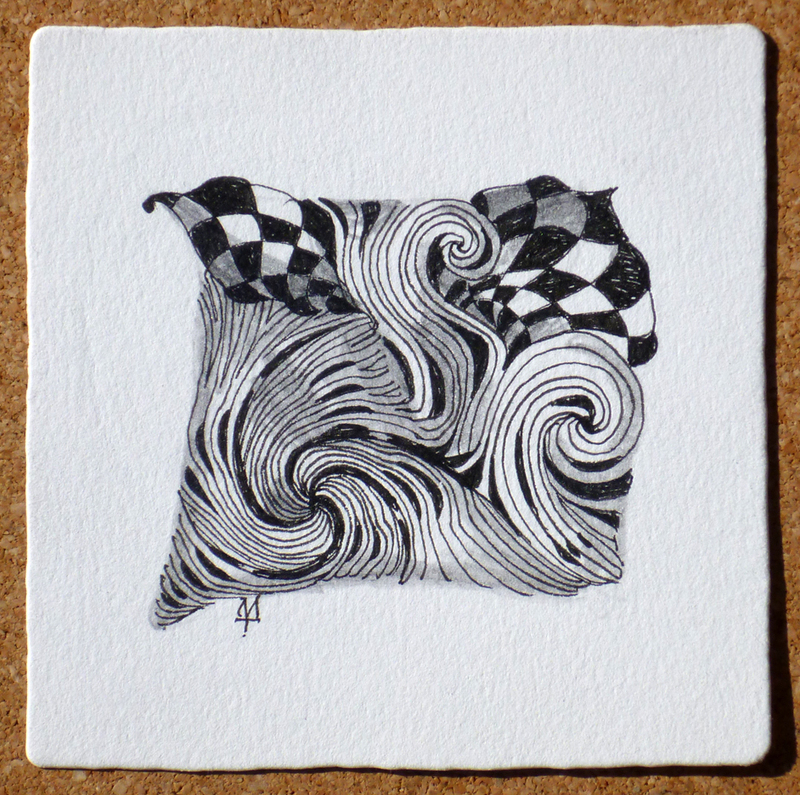 Would love to be the caretaker of one of your video Zentangles tiles. well of course i would love to have one of your beautiful tiles :) this is a really cool pattern and i love what you did with it! thanks for all your hard work and dedication, laura, you're the bomb! Happy anniversary and 100th challenge! I am so excited to be a part of it. Thank you so much for the video. It really helped with understanding the new tangles. I would love to have one of your tiles! I jumped back in again for the 100th challenge. Merry christmas to you all. Congratulations! Love these tangles. Please do enter me in the giveaway. Would love to own me a bit 'o Diva. :-D Thanks for making this world a doodlicious place!!! Videos are so helpful, and your tangles are gorgeous. THANK YOU,This is a new site for me, I have been tangling for several years. Really like what you are doing, i would love to exchange a Zentangle with you. I wasn't going to post this one as I have already posted 2, but it's a different format so I hope you don't mind! 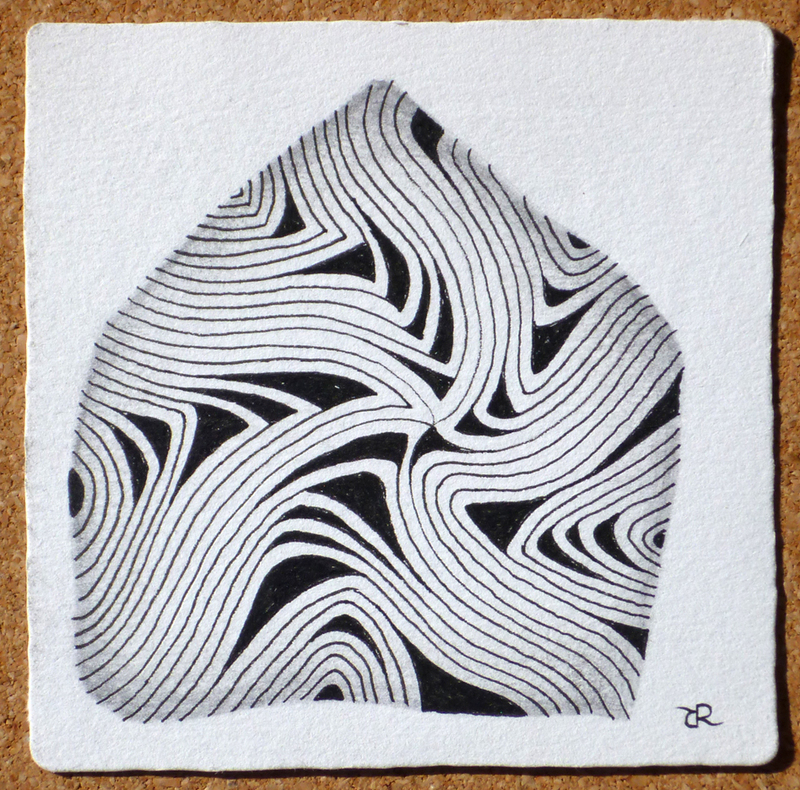 I hope the ACEO size is okay. Congratulations on the milestone. My first entry in the challenge, but it won't be my last. Thanks for doing this and giving me a challenge. Congratulations on your 100th challenge! And your anniversary! But mostly THANK YOU for sharing your life, your family, and your love of tangling with me and this wonderful community you've created. Wow! What a beautiful pattern. Really love it and would love to win one of the tangles. Great job. What a milestone, and well done! 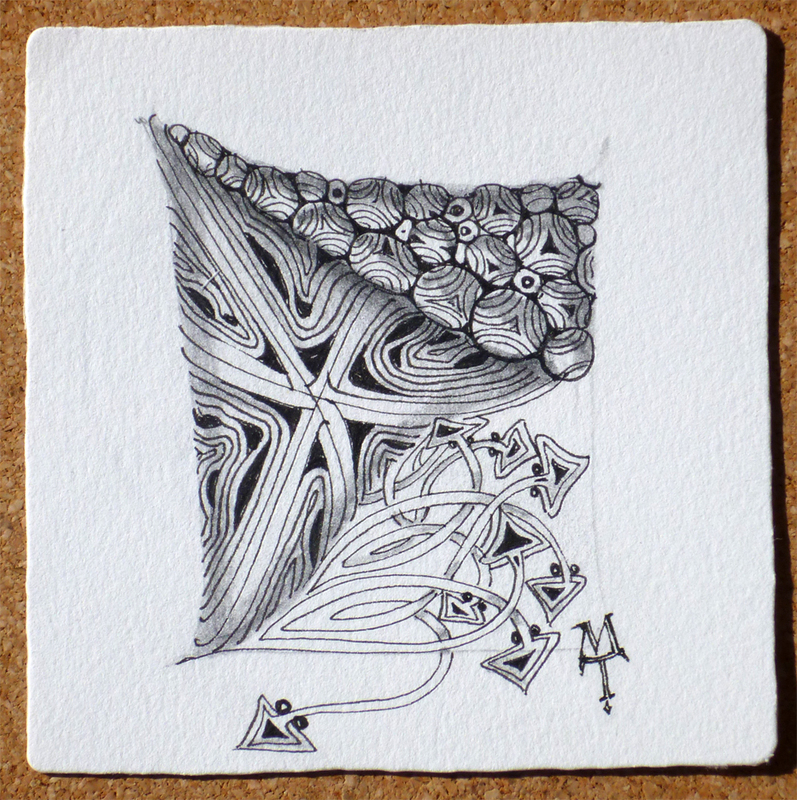 It's such fun to join in the celebration and be a part of the Zentangle community. Thank you for your work and sharing. Congratulations on your 100th Diva Challenge! wow! what an acievement! thank you for all your hardwork in making it happen each week. It's been a real pleasure, I've 'met' some wonderful people, viewed many fantastic works of art and I've learnt heaps! Thank you so much for making it all possible!I love your patterns and your tiles are very lovely - it would be so cool owning one of the Diva tangles :) Warmest wishes to you and your family for Christmas and the New Year 2013!! Congrats on the 100th challenge! This is my first one! 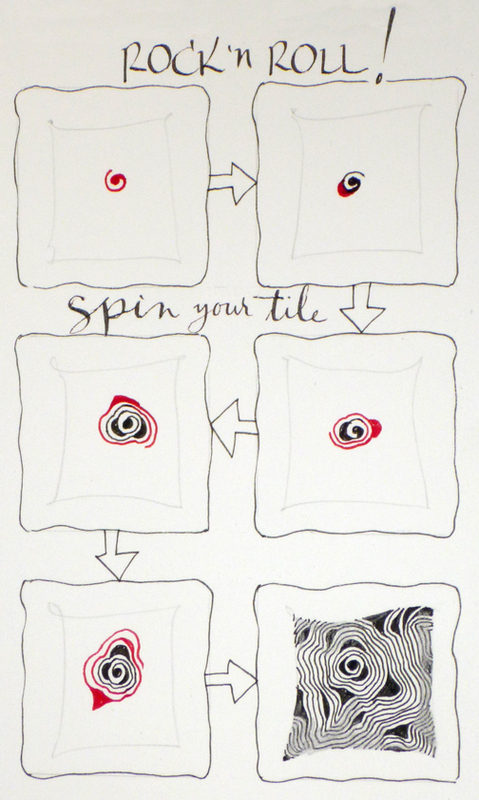 I would love to win one of your tiles! This site is quite a resource, and I am just beginning to explore it! Thanks for the chance! Amazing 100 Challenges! 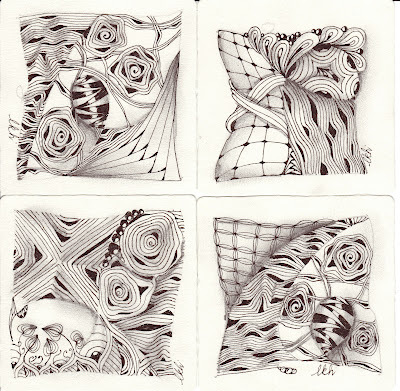 I have been working with Zentangle for about a year and use the internet quite a bit for reference. In addition, more often than not, I find myself on your site. Thank you so much for sharing! I will be doing more Challenges in the future. Again, Thank you and Congratulations!!!! Congratulations on your 100th challenge! These tangles are terrific, can't wait to try them. Congratulations Laura! And a great challenge with the new tangles! Congratulations! What an amazing achievement - and I love Diva Dance! Thanks so much for your effort in posting these challenges. Hope you and your family have a wonderful Christmas and New Year. Yikes! I'm blogging from a different laptop and things aren't working quite the way they should. I think I got the link right on the third try. Please delete the first two. Thanks and sorry about that! Thank you, Laura, for your dedication and for the warm environment you provide for these challenges. I gain great encouragement and inspiration every time I enter. Congratulations on your 100th Challenge. I admire the way, with all the challenges in life, you have voluntarily added one more, for the benefit of all of us. I wish you and yours the very happiest of holidays. I had so much fun with this tangle last night, and then I watched your video today... such fun... can't wait to do another tangle this evening. What a lovely tribute for your 100th challenge, Laura! How proud and delighted you must be! Maria and Rick outdid themselves with these fun tangles. And thank you so much for all you do for the Zentangle community! I'm new to tangling, and new to this site. Happy Anniversary and Happy Holidays. 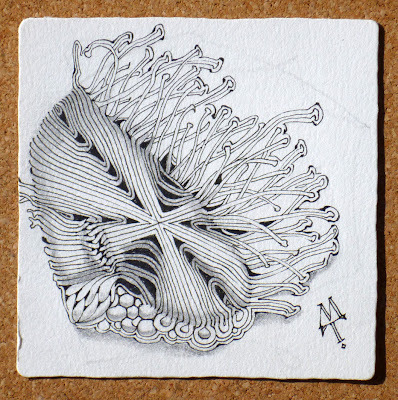 Thank you Laura for providing a weekly inspiration for tangling enthusiasts everywhere. Mondays have never been the same. Enjoy you break and see you next year. Yes, what an honor it would be to have one of your lovely tiles. Thanks again. Laura.... I've been following you since challenge #1.... what an amazing journey for you, your family and your Zentangle family...US!!!! Thank you for challenging us to use this wonderful life skill in ways we'd never imagined. Wishing you a Holiday Season of Miracles and Joy! 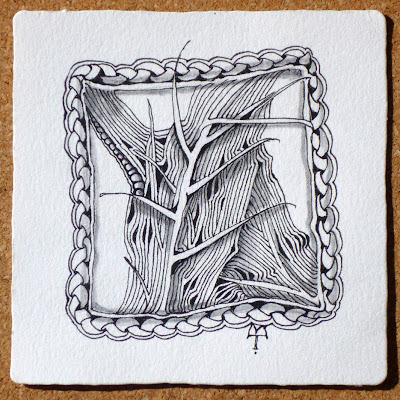 Please add my name to the drawing for one of your "100th" Tiles! Congrats on your 100th challenge! Thanks for the video, it helped me to understand the flow of Diva Dance. Laura-Diva, Happy Anniversary. 100 challenges is truly amazing. Loving the Diva Dance. Thanks for all you do for our Zentangle community and for sharing your family and your heart with us. Our dog, Mocha says hi, it is his second birthday too! Happy Holidays to your family. Congratulations!!!!! I'm so happy I found you. I just love doing the Challenges and seeing what everyone else contributes. Thank you so much for your efforts to create them each week. Thanks also for the opportunity to receive a tile. I'd like to enter and hope I'm one of the lucky ones. Wishing you and your family the best of Holidays and much abundance, joy and love in the coming year. Congratulations, Laura! I have a few words of congratulations on my post if you want to head over and read them. It's been such fun being a part of this community - thank you! Congratulations, Laura! Great job, hosting these 100 challenges! Amazing tangle by Rick&Maria, too (and what´s more, published on my birthday :) so it was kind of a present for me, as well :)). And, of course, merry X-Mas and a happy and healthy New Year to you and your family! Laura, happy anniversary and happy holidays! Thank you for everything you do. You've inspired us all each week with the challenges and with insights into your life. We all have our ups and downs, but it's how we laugh and love that carries us through, right? Rick and Maria did an amazing job on this challenge all thanks to you, Laura! I'd love to be entered to win one of your wonderful creations! Thanks. A very very very happy new year. Thanks for all your challenges en inspiration. I added the link to my blog for my first entry. =) Hope you like it! Sorry about the double entry. I copied the wrong URL for my blog post. I used the preview in the first one. Phew! So many comments! Congratulations Laura! These challenges are awesome and fun. Thanks so much for sharing them with us as well as sharing your beautiful family. Hugs to all and have a very merry Christmas! Big congratulations on many levels. Hope you and your family enjoy your break and 2013 is kind to you all. Congratulations, and keep up the amazing work. I don't know how you do all you do! Congrats to the Diva. I just took time and went thru all 102 submissions. Wow what a great bunch of very talented people. Makes me proud just to be among them. Great work to everyone. Congrats on 100 Challenges. Late to the party here but just posted my tiles for this challenge. Happy New Year everyone! A double congratulations are in order! I've managed to do some of your challenges, would love a list of all of them. And I'd love to give one of your tangles a home. I don't have a link to anything to share. Some day I may get brave and share. I especially appreciated the hint about the dance steps and downbeats, so thanks for the fun challenge! I've used it twice now ... in the bubbles for New Year's: http://tictactangle.blogspot.com/2012/12/happy-new-year.html and also on http://tictactangle.blogspot.com/2013/01/i-got-no-strings.html Happy New Year! Hi. I am excited to link my first challenge entry. Although I think I may have put it in the wrong place. My post is for challenge 101, but the only linky machine on the blog is under challenge 100. I'm wondering what pattern that is that is white with a black background and spikes on either side. If you could let me know, that would be great! Thanks! I am new to Zentangle and I just love it. It is my "secret garden" where I go and play and get so into the creative part of me I never knew I had. I found out about your site by Rick. He mentions you in his book. I'm so happy I found you. I look forward to doing the challenges. Thanks!